Thank you for coming by today for the PaperTrey Ink blog hop. I love having visitors! This month's challenge was to make a project that pulled in both silver and gold as accents.. I immediately thought of weddings and anniversaries and settled on the latter. I wanted all the gold and silver to match, so I heat embossed my papers before die cutting as well as for the stamped images. It is a sure fire way to get a match every time. And upon a new friend's suggestion, I am also adding this card to the challenge at Stampin' Celebration. susie, this is wonderful! Love how elegant and glitzy it is! Love this layout -- pretty inspired card! BEAUTIFUL anniversary card! LOVE the sequins! Very nice take on the challenge. Love the darker colors with the silver and gold. Susie, a big WOW for this beauty! Love the showcase of silver and gold! What a great layout! Beautiful card. Such a lovely card! I always love that mat stack as the "frame" for a card's focal point. Happy new year! What a beauty of a card!!! Great job!!! Beautiful card Susie! Love all the sequins and embossed detail! Happy hopping! Beautiful blend of sparkle and design! Lovely card! WOW, this is impressive!! Glad to see you in the gallery at the PTI blog hop!! Hugs, hope your weekend is awesome!!! So, so glad you could join us Susie, this is such a work of art!!! More to see it --the BETTER!! Yay!! Have a great rest of your weekend!!! 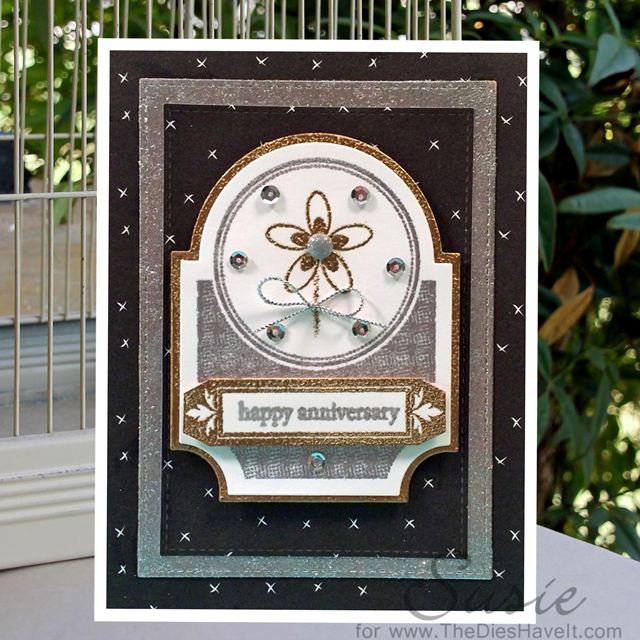 Beautiful anniversary card, with lovely little embellishments! Thanks so much for playing along with us at Stampin' Celebration! A very beautiful card! Thank you for playing along at Stampin' Celebration! So glad you joined in Stampin' Celebration - Time to come on back and vote for your top pick! What an awesome card! So glad you played along with us at Stampin' Celebration! Happy New Year to you and yours!